Before Robbie and I had Aashi, got married, got engaged, or even entered into a long-distance relationship, we discussed the idea of having children who practiced our respective religions, Hinduism and Catholicism. Religion for Robbie and me was never a deal-breaker because we wholeheartedly embraced the concept of religious equality for our relationship and our future family. We figured that if we were already comfortable attending each other’s religious services, praying for the same things, and even planning an interfaith wedding, then we could handle the challenge of raising a family that practices both faiths equally. Of course, now that we have Aashi, we are beginning to realize that “equal” is easier said than done. My internal debate over what “equal” really means began when Robbie’s parents gave Aashi a beautiful pendant depicting the Blessed Virgin Mary in honor of her Baptism. I appreciated the gift for many reasons, but I recall thinking that if Aashi was going to wear her Virgin Mary pendant regularly, then of course we would balance the symbolism with a Hindu counterpart, perhaps with a pendant depicting Lord Ganesh or even an Om symbol. With these thoughts in the back of my mind, it suddenly occurred to me that adding a Hindu religious icon could potentially hurt Robbie’s parents, who so lovingly gave their granddaughter this gift to commemorate her first Catholic rite – not a Hindu one. And while I initially felt that the addition of Hindu symbols would be the only way to respect the duality of Aashi’s faith, I realized that the addition – just for the sake of equality – would just have encroached on the significance of the Catholic sacrament we were celebrating that day. I decided to let this gift shine on its own as Aashi’s connection to her grandparents and her first Catholic sacrament. What I came to realize that day is that not all things must be equal, especially if the balancing act impacts the integrity or significance of either religious practice or tradition. That’s not to say that the balancing act is a lost cause. In fact, I think it is perfectly appropriate – and necessary – in several circumstances. 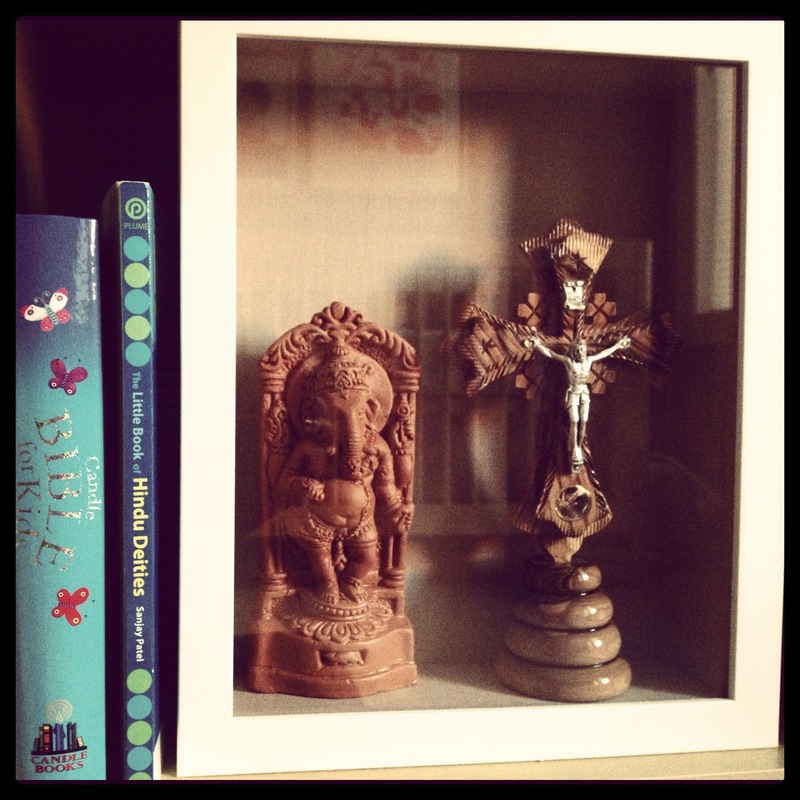 For example, it was important to me for Aashi to have religious symbolism in her room, so I found religious pieces important to Robbie and me – a rosewood crucifix that Robbie’s younger sister gave to him for Christmas and a small statue of Lord Ganesh from my dance teacher – and created a shadowbox encasing both to go over Aashi’s crib. Another example is how Robbie and I have combined our family traditions of praying together. It just so happens that my family sings prayers together daily, and Robbie’s family always prayed together in the car when starting a long drive. Now, with our own family, Robbie and I sit together while I sing my family prayer, and then Robbie says aloud the Our Father and Hail Mary prayers. (Thanks Ma, for the insistence and the idea.) Even if one of us did not have such a family tradition, it would be important to share in the combined prayer tradition. In these situations, one religion does not necessarily impede the impact or significance of the other, and I think that’s what makes them okay in equal parts. I realize now that if Robbie and I are going to maintain that Aashi is 100% Catholic and 100% Hindu, as opposed to half-this and half-that, then we have to commit to observing each other’s religious practices and traditions with 100% credence. And this means understanding that not everything we do in Hinduism or Catholicism will – or needs to – have a counterpart in the other. Because in the end, Aashi will only learn to embrace both faiths wholly and equally if we let each one stand out on its own. I recognize that the pendant dilemma is just the first of many such experiences that may incite these feelings in me, but I believe I am capable of thinking through such situations rationally. And in those moments when it gets tough, I will just remind myself to keep practicing what I preach. There will be challenges, but also unique beauty in this pathway. You can do it! Susan – it is reassuring to hear it, especially from someone who has been through the challenges that this situation brings. I love the idea that we will be creating our own new traditions as we grow together as a family and cannot wait to read and take from Meg Cox’s “The Book of New Family Traditions” that you recently wrote about! What a beautiful shadow box! I absolutely love it. You guys are doing a great job in raising your daughter. This post resonated with me a lot. I’m also in an interfaith relationship and sometimes I feel pressured to “keep score” to balance things out. You guys balance things out so gracefully. Keep up the great work. Thank you! I love your blog, by the way! We are just in the beginning stages of marriage and raising a family together, so I still have to remind myself that it is not about keeping score, but rather, about the sincerity of all our actions – not the form, and in most everything, quality over quantity.